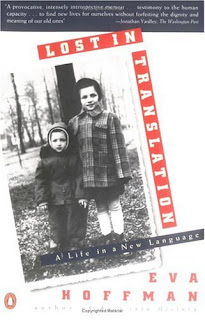 Lost in Translation: A Life in a New Language is a memoir by Eva Wydra Hoffman. Hoffman as a teenager emigrated from Cracow Poland to Vancouver Canada in 1959. From there she goes to school in Texas followed by Harvard and then eventually settles into the New York literary world. As she describes this journey, Hoffman talks about place and belonging, about being different, about being in exile. And when she finally settles into her American “life” she encounters yet another sense of exile from her childhood friends from Cracow. increments, sentence by sentence, phrase by phrase. Anyone who has spent more than a few weeks immersed in a foreign language (in a country that speaks the language) can appreciate this concept. I found her style – particularly, sentence structure - a little hard to read at times. And, there were turns of phrases that I found myself having to research to puzzle out the meaning of (e.g. I Love Lucy is a TV madeleine – that is, something that evokes a memory, not a small cake). Perhaps I should spend more time in the New York literary circles? Anyway, I like books that introduces new concepts so overall the sentence structure and phrasing was not too big of a deal. 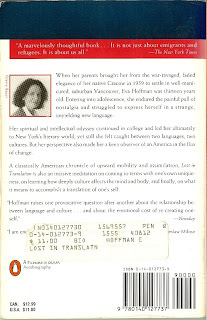 What some readers may not find acceptable or appreciate are Hoffman’s critical descriptions of North American, and specifically, American culture. She does seem to come out a little negative, but, her observations are interesting and accurate enough to allow her the space to do it. It is her memoir after all.